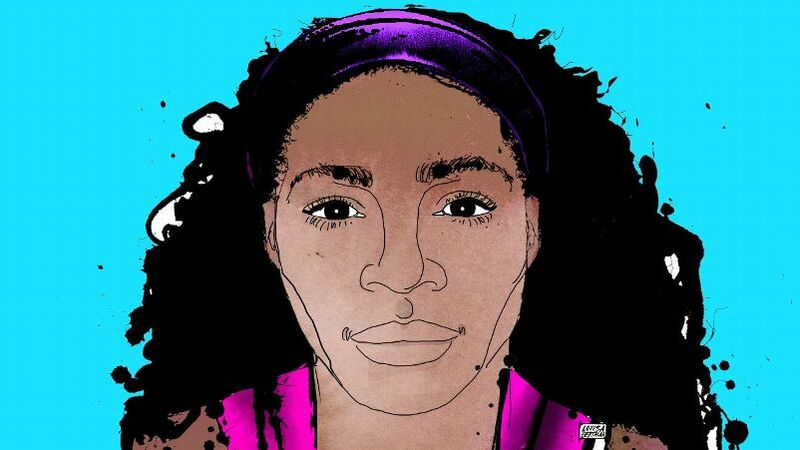 Serena Williams has made history. With a win over her older sister Venus in the final of the Australian Open on Jan. 28, Williams holds more Grand Slam titles than any player in the Open era. To win a title, a player must win seven matches over two weeks on the sport's greatest stages and against its most dominant players. Williams, 35, has done so 23 times in 66 Grand Slam appearances and has surpassed Steffi Graf's Open era record of 22. Now that she has reached 23, the buzz turns to Margaret Court's all-era record of 24, and history beckons again. Such has been the career of Serena Williams, built of milestones upon milestones, as she became the first, the fastest, the winningest. For more than two decades, she has captivated our attention and confounded our ability to easily package her enigmatic personality. She is complicated and contradictory, fierce and shy, intense yet vulnerable. Those who know her best say it's this internal turbulence that has driven her to rise from moments of despair and continue to chase excellence in a sport she has come to define, while pursuing happiness in a life that regularly tests her ability to overcome. As she continues her historic 2017 season, we offer an oral history, through more than 20 interviews with her friends, family, competitors and coaches, of the lessons, experiences, hardships and successes that have crafted Williams into the greatest competitor the sport of tennis has ever seen. Serena Jameka Williams is born in Saginaw, Michigan, to Richard Williams and Oracene Price. It's a Saturday. Oracene Price (mother): "What I remember about the day Serena was born is that she was a 10 ½-pound baby. But she wasn't a hard delivery, my youngest daughter." Isha Price (sister): "We didn't know if Serena was going to be a boy or a girl. My sisters and I were at our grandmother's house. We weren't allowed to go to the hospital, and I remember wishing and hoping we had a little brother. I remember the phone call and our grandmother calling us into one room and saying 'You have another baby sister.' I was a little disappointed." The youngest of five girls, Serena embraces the role of little sis. Growing up, she shares a bedroom and two sets of bunk beds with her siblings -- Lyndrea and Venus on the two lower bunks, and Isha and Yetunde on the upper bunks. Each night, Serena crawls into bed with a different sister. When it comes to her older sisters, Serena always gets her way. Isha: "We would have these family talent shows, and Serena always had to win. She always sang the same song, 'Greatest Love of All' by Whitney Houston. Even if she sounded like screeching tires, she won. That's what we had to do or she would throw a tantrum and cry. We didn't want to deal with the repercussions of her not winning." Oracene: "With Serena, everything had to be perfect and she would get frustrated if it wasn't. She always had to win, no matter if it was a talent show, cards, she had to be the winner. She would sit on cards. And they let her do it. They gave it to her, even if she didn't win. I think it affects her to this day, because she hates losing. That's how come it was so inappropriate when they said we were setting matches. Serena is not going to lose for no one." In 1983, the family moves to Compton, California. After learning that top female tennis players can earn thousands of dollars per tournament, Richard and Oracene begin teaching themselves the game in order to coach their daughters. When Serena is 3 and Venus is 4, they pick up their first rackets, and their parents set to work. Richard eventually leaves his job to coach the girls full time. Serena is a quick study. 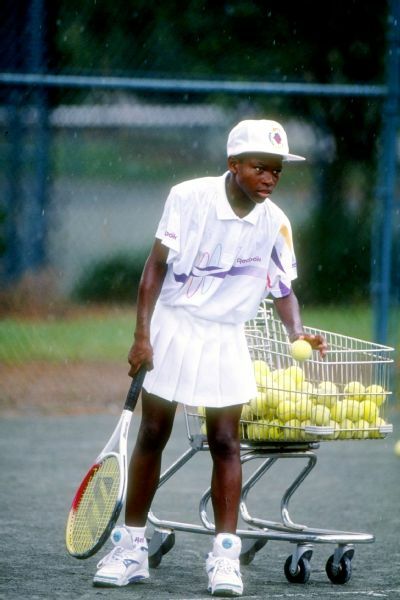 In 1991, she plays her first junior tournament at the age of 9 and makes it to the final, where she faces Venus. Isha: "Venus was older and playing tournaments, and Serena wasn't playing tournaments yet. Venus was enrolled in this particular tournament, and Serena wasn't. Unbeknownst to my dad and mom, Serena sent in the application and signed herself up for the tournament. Who does that? You had to pay to sign up, and the tournament directors had to get the money from my parents. She always wanted to be just like Venus; it was that little sister hero-worship thing. Even then, she wanted to compete." Venus Williams (older sister): "She got tired of watching me play. She wanted to play. Back then, I was bigger and stronger, and in the changeovers during the final, she'd say, 'Venus, let me win a game.' I ignored her. We were supposed to be professional. I ended up winning the tournament, and afterward I said, 'Serena, I think we should switch trophies. I like the silver one better anyway.' She was the little sister, so she had no problem taking my trophy. We still have them in our home in Florida." Unlike most young players, Serena and Venus play few junior tournaments. Richard chooses instead to hold his daughters out of competition until they are ready to compete on the pro tour. In 1991, they meet with their first high-profile professional coach, Rick Macci, in Compton. A few months later, the family moves to Florida so that Serena and Venus can train with him at Grenelefe Golf & Tennis Resort in Haines City. "They picked me up in a Volkswagen van. It was shaking back and forth, three months' worth of McDonald's wrappers, clothes, Coke cans, bottles and a spring coming out of the seat. We get to the courts, and it's not a country club. It's a crummy park. There are guys playing basketball, people passed out in the grass, broken glass all over the courts, people drinking beer. Every person we passed called him King Richard. We had to cross the basketball court to get to the tennis courts, and it parted like the Red Sea. "Usually after five minutes I can tell if there is something special. We're hitting balls, and I'm going, 'These girls aren't that good.' There were arms and hair and legs flying everywhere, beads flying out of their hair. They were improvising, hitting off their back feet. Then I said, 'Let's play some points.' I swear to God, their stock went soaring through the hemisphere. Their footwork got better, their prep got better, they cleaned up their act. What blew me away was their burning desire to run and fight and get to every ball like their hair was on fire. I had never seen two kids try so hard. I had never seen bodies that could move like that. Athletes with their body types went to other sports; they didn't play tennis." Lyndrea Price (sister): "Their journey was my journey because I had to wake up too. When Venus and Serena left, I left. It was a family effort. We didn't have a hopper, because those were expensive, so I would shuffle the balls with my racket and pick them up. I wasn't playing, but I was out there every day. "Even as a kid, Serena was built. She was so muscular. She didn't have to do a lot of work to get that physique. It was an anomaly that she was gifted at 3 years old to have that body. I remember thinking, wait 'till they get a load of you." Freddy Bryant (East Compton Park employee): "We always had to have the courts cleaned and hosed down because Richard stayed on us. He would bring generators, tennis-serving machines, and the girls would work. Mom would sit in the van and read books. She was always reading. When they finished, the girls would come inside and play pingpong and eat the summer lunch we served to the community. One day stands out to me. Serena was out by herself, going from baseline to baseline and Richard was like, 'You wanna quit? You wanna quit? Go sit in the van with your mom.' Serena said, 'No. No.' She didn't give up, and every time she hit the ball, I heard that grunt. She was 10 years old. She was grunting and fighting. I was like, 'Wow. This little girl right here, she's a tiger.'" Nick Bollettieri (legendary tennis coach, head of the IMG Academy): "I remember Richard Williams coming to my house in Longboat Key with his two daughters and saying they would be bigger than Michael Jordan. They all thought Richard was crazy. But he did something no one else did. He kept them back from tournaments and taught them technique and to go for it. Their daddy said, 'Run for every ball.' And Serena would say, 'Daddy, the ball is out.' And he'd say, 'No ball is out. You have two sets of eyes: your eyes and your brain. By the time your brain registers what your eyes think they see, it's too late. But when you move, you get the ball.'" Macci : "One day, Venus was out there grinding. Serena wasn't working hard or moving her feet. I said, 'Jameka [Serena's middle name], you have to start moving.' 'What are you going to give me?' she asked. 'I'm tired. I'm thirsty. If you get me a Pepsi and some curly fries and a Snickers bar ... and on the corner, they're selling Green Day T-shirts. If you get me that, I will work 100 percent for the next hour.' This was her maturity. I had an assistant get it all but the shirt, and this girl moved her feet on the court like Spider-Man. For one hour, this girl was on fire. When that hour was up, she said, 'I'm done and I expect that Green Day shirt here at 8 a.m.'"
At age 13, Serena makes her pro debut in the qualifying draw at the Bell Challenge in Quebec, where she loses in less than an hour. She doesn't play a tournament in 1996. At the 1997 Ameritech Cup, she upsets No. 7 Mary Pierce and No. 4 Monica Seles, becoming the lowest-ranked player (No. 304) in the Open era to defeat two top-10 opponents in one tournament. She loses in the semifinal match. Bollettieri : "From the years I traveled with the Williams family and they came to my camps, the story I most remember is Serena sitting in the shade in my stadium court, head down, so upset. She said, 'Nick, I'm tired of coming in second place.'" 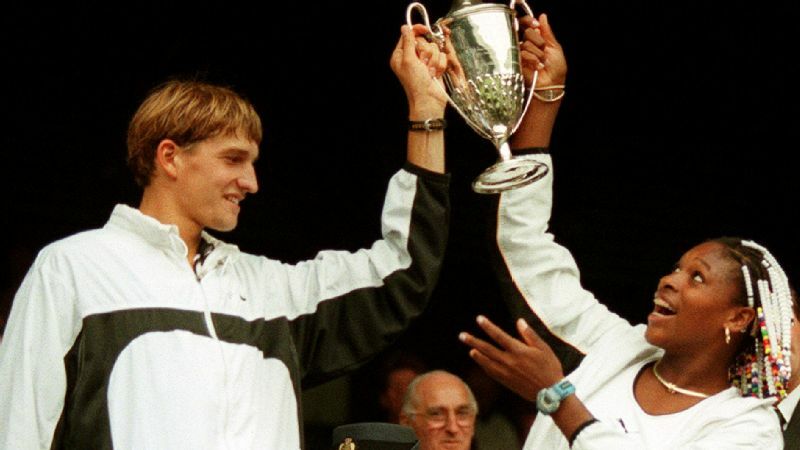 Serena Williams and Max Mirnyi after winning Wimbledon mixed doubles in 1998. Serena and partner Max Mirnyi win mixed doubles at Wimbledon and again two months later at the US Open. Macci : "In practice, all Serena did was play guys. She beat guys three to four years older than her. It didn't matter who was on the other side of the net. She didn't look at it like this girl is ranked this or that guy is 16. At 11, she told me she thought she was better than John McEnroe. She said, 'Did you ever see his strokes? He has terrible strokes. I can beat him for sure.' It was silly, but she meant it from the heart. And she believed it. A great competitor is borderline cocky and courageous." Serena, ranked No. 11 in the world, and Venus, No. 4, make their Fed Cup debut. Serena is a last-minute replacement by coach Billie Jean King when Seles pulls out with tendinitis in her right arm. 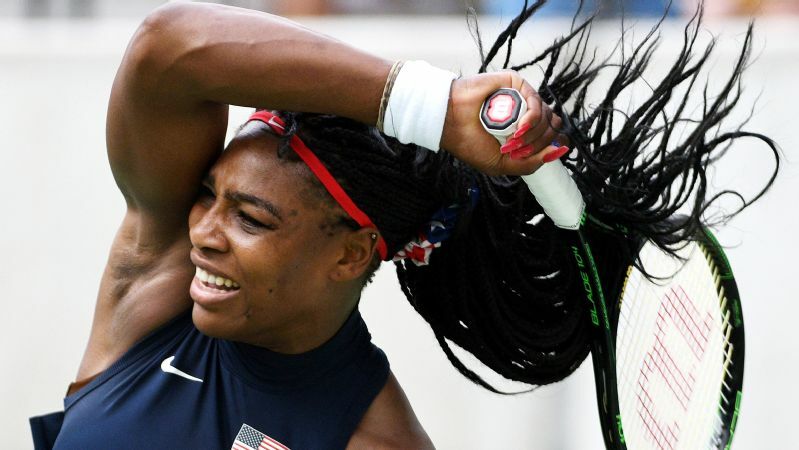 The Williams sisters account for all four wins in the U.S. team's 4-1 victory over Italy, sending them to the final. Mary Jo Fernandez (former professional tennis player, broadcaster, member of 1999 Fed Cup team): "She was young, a teenager, and that was my first glimpse of her inner strength and confidence. She was for sure the leader. And her sense of humor -- she's funny. She makes fun of herself. She carried this purse everywhere she went. If someone's pantyhose ripped, she pulled out a pair of pantyhose. It became a running joke during the tournament that whatever you needed, Serena had it in that bag." At only 17, Serena wins her first Grand Slam title at the US Open, becoming the first African-American woman to win a major in the Open era. She jumps to No. 4 in the world rankings. It's a Saturday. Venus: "I was the older sister, and everyone thought I would win the first major, but she did. I felt motivated. Now I know what to do. Serena showed me what to do. That was crucial in my success in winning big events. It was a turning point in my career. At the time, I didn't think to say that to her, but over time, I've told her, 'If it wasn't for you, I wouldn't have done anything.' We have a good laugh about that." Serena's win in Flushing Meadows lands her on the cover of Sports Illustrated. Hollywood comes calling. In December, she guest-stars on "Hollywood Squares," and then, along with Andre Agassi, Pete Sampras and Venus, Serena records an episode of "The Simpsons" titled "Tennis the Menace." Bonnie Pietila (longtime producer and casting director for "The Simpsons"): "Venus and Serena recorded together, and they came to the Fox lot in a big SUV. Serena brought her dog. She was so good. She has voice control. And she can act. There have only been two people who have come in and I've been blown away at how good they were, because they aren't actors: Serena and Peter Frampton. When a nonactor comes in and can be that good, it's a wonderful surprise. 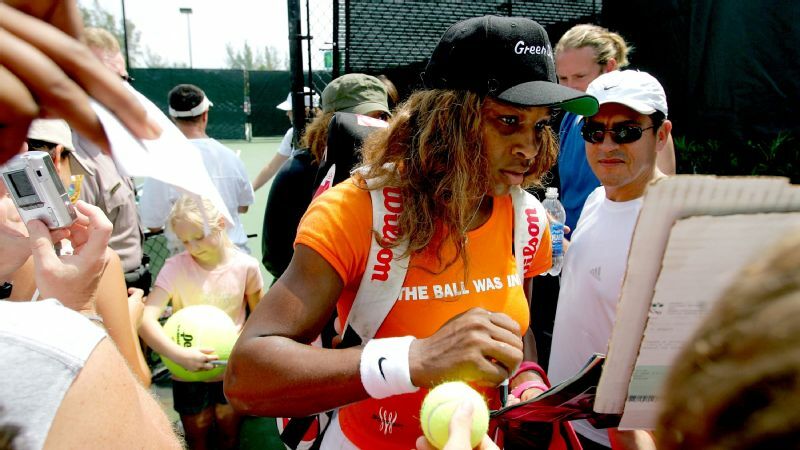 "After Serena and Venus finished recording the episode, it came time for them to sign covers of copies of the script. They each sat down in front of a pile of covers, and the two of them raced each other to see who could sign the fastest. Serena won." Venus, ranked No. 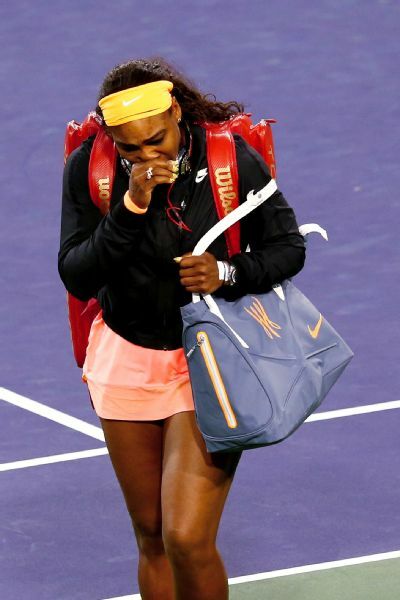 3, withdraws from her semifinal match at Indian Wells against Serena, No. 10, citing pain from tendinitis in her knee. Serena automatically advances to the final against Kim Clijsters. As Venus and her dad walk to their seats before the match, Richard says they are attacked with racial slurs. When Serena beats Clijsters, fans boo. The sisters vow never return to Indian Wells. Later that year, the sisters meet again, in the final of the US Open -- the first Williams vs. Williams Grand Slam title match. Serena loses 6-2, 6-4 to big sister Venus. Venus Williams lifting the US Open trophy after defeating her sister Serena in 2001. Pam Shriver (former top-five professional tennis player): "It was the first prime-time US Open final. There had been sensational buildup, and CBS was up against a huge college football game. Venus won and Serena was so angry about losing to her sister. She had a look that was totally different from the look Venus had when she lost. Venus always thought if she had to lose, it might as well be to a family member. But Serena hated it more because it was her sister." After withdrawing from the 2002 Australian Open with an ankle sprain, Serena goes on a tear. She wins her first clay-court title at the Italian Open, the 2002 French Open, her first Wimbledon title and the US Open. She returns to the Australian Open a year later and wins, completing the Serena Slam by holding all four major titles simultaneously but not in the same calendar year. Incredibly, Serena faces Venus in all four finals matches. Shriver : "It is the most unlikely thing that has ever happened in our sport -- that siblings would face off against each other in the final of four straight majors; it is a once-in-a-galaxy type of thing. Nowadays you don't get the same rematch in one major final. That Serena won wasn't surprising. She is an all-around better tennis player than Venus. She has better technique, better grit and a more competitive, grinding spirit. Richard forecasted that a long time before there was ever a Serena Slam. It's hard to believe they grew up with the same coaching. They're so different. It's almost like Venus, being the older sister, was the guinea pig on certain shots, and they got the technique better with Serena." Serena's oldest sister and assistant, Yetunde Price, is killed in Compton, caught in gang crossfire while in the car with her boyfriend, a gang member. Serena is the first to learn of her sister's death and informs her mother and 'Tunde's children. Isha: "The thing I hated most about that situation was that Serena was the one who got the call. They had attempted to call us all, but it was late and my phone was off. We relied a lot on each other; it was us holding each other up at a really difficult time. Unless you've experienced that kind of loss, you can't fully describe to somebody else what that feels like, like part of yourself is gone. You have to almost re-learn how to live, how to approach every day." Shriver: "That news hit her very heavily. Her resilience throughout some major personal setbacks, her parents' divorce [in 2002], her sister's killing, her medical situations, she's had her share of heartbreak as far as relationships -- it's so impressive she's been able to stay on tennis track through such significant personal adversity." No. 10 Serena loses to No. 15 Maria Sharapova in the Wimbledon final. Shriver: "Losing to Sharapova made Serena the champion she is today. Losing to her in straight sets was a stinging loss that catapulted Serena, in the big picture, to greater heights. That loss, followed by another to Sharapova at the year-end championships -- the last time Sharapova beat Serena --- was important for Serena. She didn't want to lose in major finals. Her record today in major finals is amazing, only six losses." Serena Williams falls to the ground during the 2004 Wimbledon final, in which she lost to Maria Sharapova. After winning her second Australian Open on Jan. 29, Serena spends much of 2005 and 2006 struggling with knee injuries, poor conditioning and depression stemming from her sister's death. She begins searching for life outside of tennis, guest-starring on TV shows and attending movie premieres. In the May 2006 issue of Tennis magazine, Chris Evert pens an open letter to Serena, imploring her to recommit to tennis. Two months later, Serena dips to No. 140 in the rankings. Chris Evert (former world No. 1 professional tennis player, tennis broadcaster): "I always thought she could be the greatest of all time. But when I wrote that letter, I didn't think she was taking it as seriously as she could. She was losing to players she should have been beating, she wasn't in good shape, she was going to movie premieres, she was distracted. I didn't want her to look back when she retired and think, 'All those years I squandered and I should have been in the best shape, I could have been more focused.' I didn't want her to have regrets. But what I didn't take into consideration was that she was going through a lot in her personal life too." Serena begins to rekindle her love of tennis and takes her first of several trips to Africa for charity appearances. She decides that if she is going to play, she is going to win. At the 2007 Australian Open, unseeded and ranked No. 81, she astounds the tennis world by beating Sharapova 6-1, 6-2 in the final. Oracene: "Going to Africa changed her life. She came back a totally different person. She fell in love with Africa. That helped her to refocus on her life and her career. Seeing where she came from, how we got to where we are now, seeing the ports where they shipped us off and the life of our people, that really changed her attitude about being a black woman." Newly determined, Serena begins working with renowned fitness trainer Mackie Shilstone. Serena and Venus win doubles at the 2008 Beijing Olympics under U.S. team coach Zina Garrison. A few weeks later, Serena wins her third US Open title. Mackie Shilstone (fitness trainer): "I worked with Peyton Manning before his final season. I've worked with thousands of professional athletes, some of the best in the world. I evaluate them all on their mental toughness, and Serena is one of the most mentally tough individual athletes I have ever seen, man or woman, in 30 years of experience." At the 2007 Australian Open, unseeded and ranked No. 81, Serena Williams astounds the tennis world by beating Maria Sharapova 6-1, 6-2 in the final. Serena launches a second clothing line (her first, Aneres, launched in 2003), this time with the Home Shopping Network, and appears on HSN for the first time. Mindy Grossman (CEO and director, Home Shopping Network; former global VP of apparel at Nike): "When she's on HSN, we take calls from viewers. The number and diversity of people who call in to talk to her is incredible. Normally if someone calls in, they have the product, are buying the product or want to talk about fashion. With Serena, they feel they have a connection with her; they're calling in to talk with someone they know. Everyone who appears on HSN gets a report card every visit. Each time, she wants to do better than the last time, and she wants to know who else is doing well." Isha: "She is completely invested in her fashion line. It's not just 'show up and smile for the cameras at HSN.' She has to understand what goes into making the clothes, why they chose that fashion. Her days, they're nightmarish in terms of what she has to do in order to execute her life." 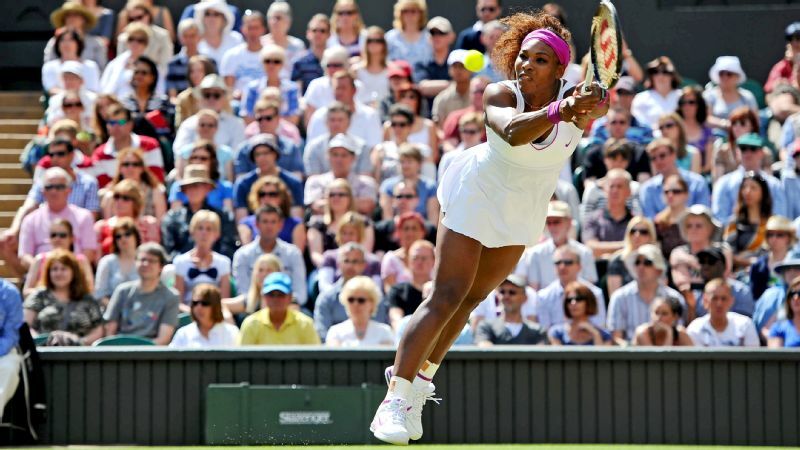 Coming off a win at Wimbledon and having won three of her past four majors, Serena makes it to the semifinal of the US Open, where she looks to defend her 2008 title. In the semifinal, Serena plays Clijsters, at the time an unseeded wild card who had last won the tournament in 2005, and loses the first set 6-4. She bashes her racket on the court, earning her a warning for racket abuse. In the second set, with Clijsters up 6-5 and Serena serving to send the set into a tiebreak, lineswoman Shino Tsurubuchi calls Serena for a foot fault on her second serve. Serena argues the call, threatens the lineswoman by saying, "I swear to God I'm [expletive] going to take this [expletive] ball and shove it down your [expletive] throat," and is assessed a point penalty for unsportsmanlike conduct, ending the match. Three months later, she is fined $82,500 and placed on a two-year probation. It's the largest fine ever levied against a professional tennis player. Shriver: "Most every player would say how unlikely it would be for you to be playing a two-and-a-half-hour match and for the only foot fault to be called that late in the match. That would have been Serena's initial anger. Why, at this crucial moment, is this my first foot fault of the night? "It was a hurtful moment for her on many levels. I don't think her intent was to lose it and say what she said. I just think in the heat of the moment, it's what happened. The publicity from that match and how she reacted was so difficult, so negative, that it didn't help her public popularity. "In the last year and a half, especially, when Serena has had challenging moments, she has been much more gracious, given the opponent more credit. That doesn't mean she won't get mad and smack her racket and get upset. She still has her moments, but that's normal. But that was her worst moment." Isha: "I felt like she was being denied an opportunity to make a mistake. We've all said and done things we're not proud of because we're not perfect. But she didn't have the ability to be human. And nobody wants to feel like that, like I can't say anything, I can't do anything. If I'm not swinging a racket, people don't see me as a person. All they see is this sportsperson, and in this moment, as a woman and as a black woman, I'm not supposed to be able to express hurt when I know I'm being cheated. That's taking my voice, taking my humanity. So in that moment, I was most protective of her. "What she learned is you have to keep yourself in check and handle your situations with dignity and grace. Sometimes you have to be the bigger person, even on the court, calm down and know that it's just a game and understand the space it should hold in your life. These are all parts of a bigger lesson." Shilstone: "Some of her outbursts on the court, they have been misconstrued. I was there when the woman called the foot fault. That woman missed completely. People don't think athletes are supposed to be human or have heart. There is no malice with Serena. It's the heat of the battle. Afterwards she apologized, but that is forgotten." Oracene: "It wasn't just that call. All the years and emotions popped out at once. Balls that were clearly in, that everyone in the stands could see were clearly in. That was her breaking point." 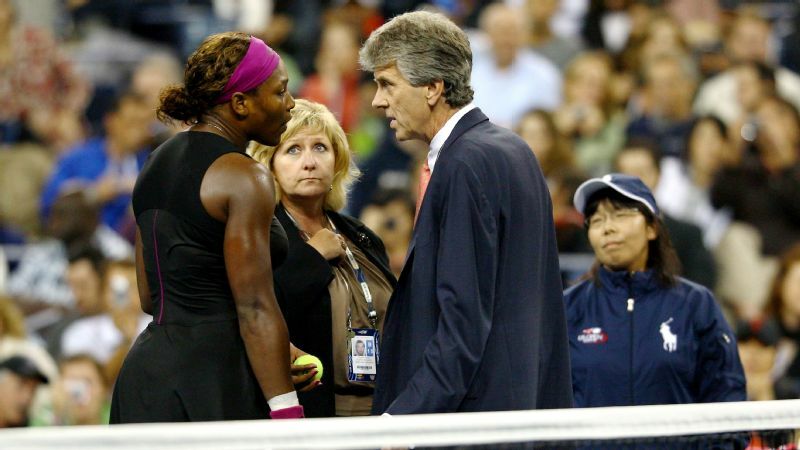 Serena Williams arguing with the officials after her foot fault in the 2009 US Open. Serena beats rival Justine Henin in the Australian Open and wins doubles with Venus. But a nagging knee injury forces her to miss the next four months of tennis. To fill her time, Serena researches schools and enrolls in a 240-hour course at Palm Beach Nail Academy to become a certified nail technician. She says she plans to complete the course in one year while being the school's top student -- and its most fashionable. She practices her new craft by giving Oprah Winfrey a pedicure on air. Isha: "She's always been obsessed with her nails. And then it became, 'I could do this myself. I'm going to nail school.' She was completely fascinated. I didn't believe her. Then she got injured and couldn't play, and she enrolled herself in nail school. Then these opportunities started coming in. One day, she was like, 'If I do Oprah's nails, will it count for my hours?' Absolutely. Once she mastered it, it was almost like, 'OK, that's done. Finished and check and on to the next thing. What am I curious about now? How do I want to grow now?'" Four days after winning Wimbledon, Serena is walking out of a restaurant in Munich when she steps on broken glass, lacerating a tendon on the top of her right foot. This begins a bad run of health for Serena: In October, she reinjures the same tendon, forcing her to have season-ending surgery. Then, in January, a pulmonary embolism is detected in her lungs. Serena undergoes emergency treatment in March 2011 to remove a hematoma related to the embolism and is hospitalized at Cedars-Sinai Medical Center in Los Angeles. Serena says the scary experience is as mentally difficult as the death of her sister. She does not play again until June. Isha: "Seeing her in the hospital, in the bed, her eyes were closed, she was connected to tubes, and we didn't know the severity of the diagnosis, and I was terrified. This was our baby sister. When we found out everything, it became extremely real. We'd already suffered loss, and it was unfathomable to me that we would get hit like that twice, with the first [sister] and the last. It seemed like it wasn't even possible. We all prayed." Shilstone: "A couple of months later, we were training in West Palm Beach and she was fit, but she was grabbing her chair. She was wheezing. I realized she was still suffering from the pulmonary embolism. It was the battle of our lives. Before her next match, I told her, 'You've been introduced to death. You can't be worried about the woman on the other side of the net.'" Away from tennis for nearly a year, Serena returns to the court but struggles to find her game. She loses in the fourth round at Wimbledon and drops to No. 175, her lowest ranking since 1997. Then she loses in the final of the US Open in September. Around this time, the ever-curious Serena begins taking online classes at UMass University Without Walls. Her major is business management, which she later switches to pre-med. On the court, her losing streak continues into 2012: She gets knocked out in the fourth round of the Australian Open in January and in the first round of the French Open in May. It is her first loss in the opening round of a Grand Slam -- and the last straw. Having recently been introduced to French tennis coach Patrick Mouratoglou by her friend and fellow pro Grigor Dimitrov, Serena reaches out to Mouratoglou. Patrick Mouratoglou (Serena's coach since 2012): "A few days after her [French Open] loss, she called and asked if she could come to the academy to practice. Most players leave town after they lose. She said, 'I want to practice because I want to win Wimbledon.' She wanted to get back to winning a Grand Slam and being No. 1. She hadn't won a Grand Slam for two years and was very disappointed. I said yes, and she asked for two hitting partners. She came and hit for 45 minutes. I was there but was not supposed to say anything to her. At the changeover, she sat down, turned to me and said, 'Speak to me.' So I spoke to her. Then she said, 'Can we start now?' And I said, 'Of course.'" With Mouratoglou, Serena works on her serve placement and tactics, as well as her confidence and conditioning. In April, in another unconventional move for a top player two decades into her career, Serena switches from natural gut to hybrid racket strings. Three months later, she wins Wimbledon for the fifth time. She follows that performance by winning two Olympic gold medals, in singles and doubles, at the London Games. Serena Williams at Wimbledon in 2012. Mouratoglou: "She fought incredibly at Wimbledon. She is always a fighter but maybe more in that tournament than ever. She was coming to the matches with a plan. Of course, winning Wimbledon made a big difference in terms of her confidence. It's the same for every player ... the more you win, the more you win." Fernandez: "At the Olympics, she went through the draw without dropping games. I've never seen anything like it. We're used to how great she serves, but it wasn't only her serve. It was her returns, her groundstrokes, her volleys. She beat players like [Victoria] Azarenka and Sharapova without losing games. It was remarkable. It's the best I've seen her play." Serena, 31 and the oldest female tennis player to be ranked No. 1, wins her fifth US Open. The next day, Serena attends the men's final at Arthur Ashe Stadium with Nike CEO Mark Parker. Serena, a longtime Nike spokeswoman, jokes that she will one day succeed Parker as president of the company. Mark Parker (president and CEO of Nike): "I joined Serena to watch the men's US Open final between [Rafael] Nadal and [Novak] Djokovic. I asked her what she thought of the match, and she told me she had been taking mental notes on how to improve her own game -- the day after winning the Open. During the [2015 Australian] Open, I texted her and asked what she was doing between matches. I found out she was taking pre-med courses." Isha: "She loves holistic medicine. It's a real part of her study and what she wants to do. She's actually really good at it. We have this family event we do, and Serena wrapped me. She knows the muscles and the bones. It's almost irritating. It's like, how much can you learn? She wanted to speak French, so she's fluent in French. Whatever she sets her mind to do, she goes after it with so much enthusiasm and commitment until she gets it done. There are so few people in the universe who do that." 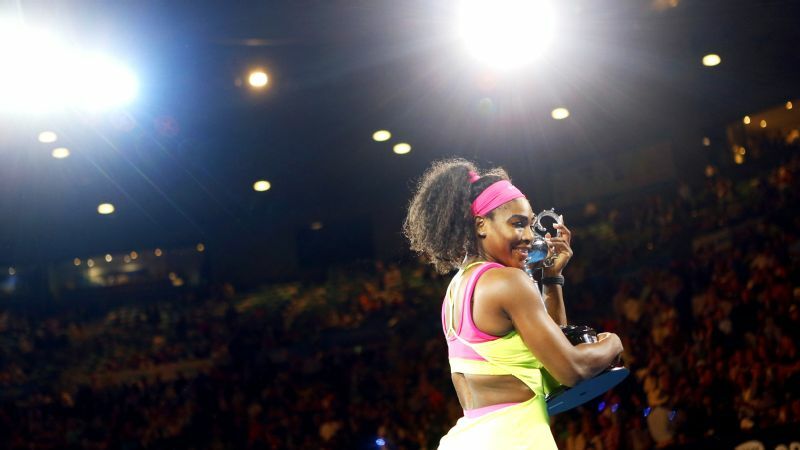 Serena meets Sharapova in the Australian Open final for the second time and wins 6-3, 7-6. It is her 16th straight victory over Sharapova. Serena becomes the oldest winner of the Australian Open at 33 years old. It's a Saturday. Serena Williams is overcome with emotion as she arrives on court at Indian Wells after a 13-year boycott. Mouratoglou: "At the start of the year, she wanted to win. She was hungry. Journalists ask me always, what are my goals for the start of the year? The goal is to win the four Grand Slams. When I work with someone like Serena, what else can you have?" Serena returns to Indian Wells after a 13-year boycott of the tournament. A knee injury forces her to withdraw in the semifinals. Isha: "She talked to my mom and dad and then came to me and said, 'I'm thinking about going back to Indian Wells.' I said, 'Really? Are you ready for that?' It took her to come to a place where she was understanding of who she was and how far she had come, so that Indian Wells didn't matter. You have to get to a place in yourself where, win, lose or draw, I'm doing this for me. I'm not doing it for anybody else. I'm doing it because it's the right thing to do for me at this point in my life. And to watch that process and see the reception she got, it was overwhelming. "All the years when people were asking, 'Are you coming back?' Saying, 'Come back, please come back.' Now it was not anybody asking her -- but her making the decision. I was extremely proud because I don't know if I could have done it. She taught us all in that moment." Garrison (former professional tennis player, second African-American woman to make a Grand Slam final, at Wimbledon, 1990): "I think she's learned a lot about forgiveness over the years. What she did last year at [Indian Wells] blew my mind, made me cry. The fact that she's been big enough to humble herself in that way and show forgiveness was a strong statement for the times we live in right now, when young people need to see a leader like that. She said it felt right to her. Forgiveness was a big part of it, and not wanting to dwell on it anymore. That kind of energy brings you down, when you're holding on to old anger. The fact that she got to forgiveness, that can only be done by looking into yourself, deciding to be the best person you can be and making changes within yourself." After reading Facebook COO Sheryl Sandberg's bestseller "Lean In," Serena strikes up a friendship with Sandberg and her husband, Dave, in early 2015. When Dave dies of a heart attack in May, Serena reaches out to comfort her friend. Lyndrea: "Serena is the type of person who will call you to make sure you're OK. She'll call every 10 minutes if she thinks something is wrong. She'll sense this. Sheryl Sandberg lost her husband, and she did this for Sheryl for, like, months on end, every day. In order to help someone else, you have to have been through it. You go through things so you can uplift someone else. And that's what Serena did. I'm most proud of her in those moments. It's not about money, press, fame. It's about human connection." Serena reaches the semifinal of the French Open. Sick with the flu and down 4-6, 2-3 to No. 23 Timea Bacsinszky, Serena digs deep, wins the next game and doesn't drop another game in the match. She goes on to win the tournament, beating Lucie Safarova in three sets in the final, her 20th Grand Slam victory. 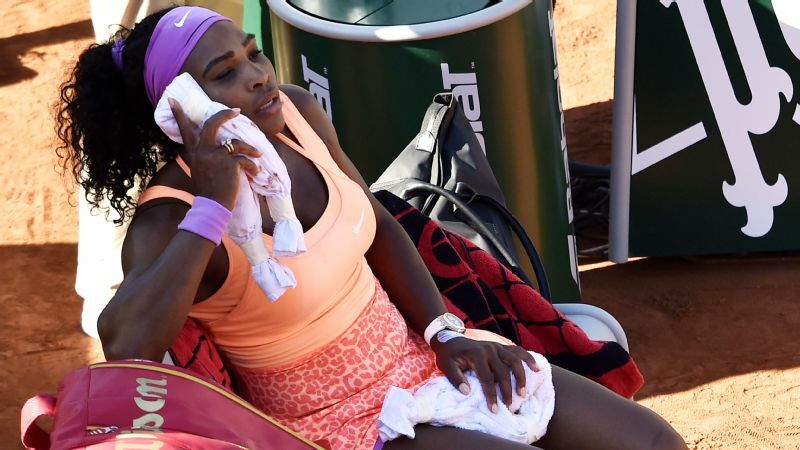 Serena Williams was sick with the flu during the 2015 French Open. Mouratoglou: "I don't think I've seen a player play being so sick. She would stay the whole day on the sofa and try to go out for a walk for 10 minutes and come back after two minutes. Not being able to sleep and having so much fever throughout most of the tournament, from the second round to the semis, then to play at the highest level, in the sun, and win against the best players in the world was impressive." Serena beats Garbine Muguruza 6-4, 6-4 to win Wimbledon for the sixth time and, at 33 years, 289 days, becomes the oldest player to win a Grand Slam singles title. 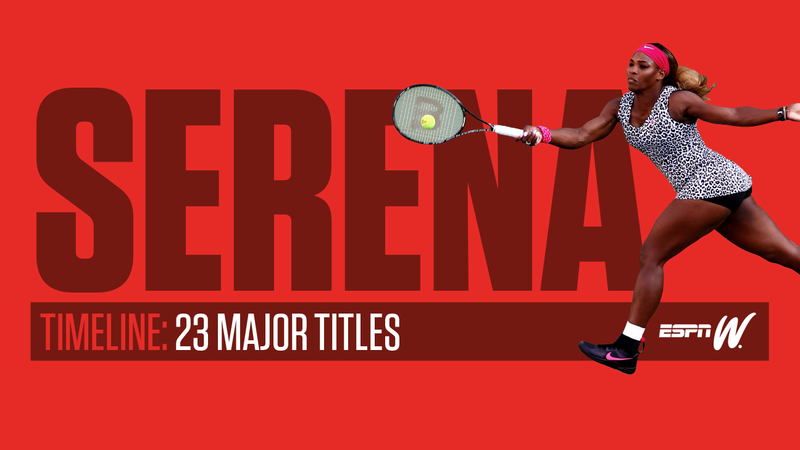 With the win, she earns her second Serena Slam by holding all four major titles at once. She is one win from tying Graf's record of 22 Grand Slam wins and becoming the first woman since Graf in 1988 to complete the calendar-year Grand Slam. Mouratoglou: "Before winning Wimbledon, she had won two Grand Slams, but it's only two. For her, it's not incredible. But when she won the third, you start to think, 'Now we are getting close to something big.'" 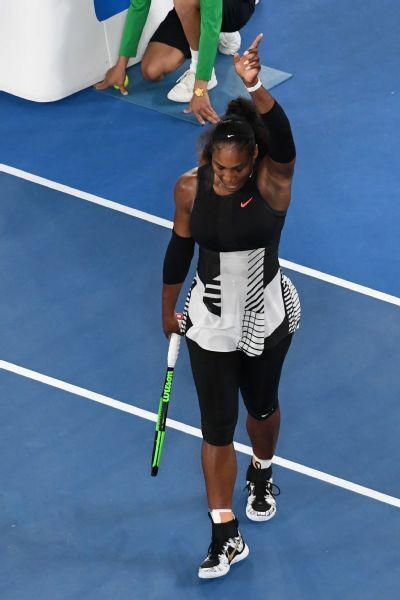 Serena Williams after winning the 2015 Australian Open. 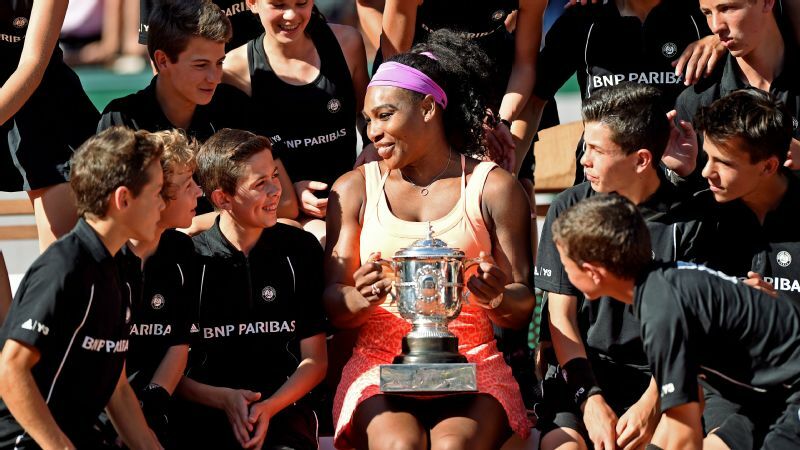 Serena Williams holds her French Open trophy and gathers with the tournament's ball boys and ball girls. 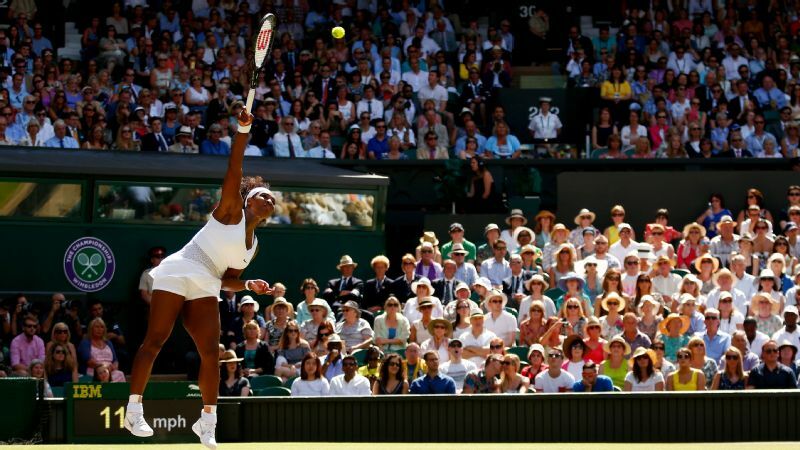 Serena Williams serves during the 2015 Wimbledon final, which she goes on to win. At the Rogers Cup in Toronto, the warm-up to the US Open, Serena loses to Swiss teen Belinda Bencic in the semifinals. Mouratoglou: "She comes to me the morning after and says, 'We have to go practice; I'm tired of losing.' We were in August. She'd lost three matches ... in a year." Shilstone: "We do a thing called the Mackie Short Shuttle. It's a series of sprints with recovery time between them, and the sprints and the rest get progressively shorter as the workout goes on, but they go up in number. When we first started, Serena was falling out at different times. Last year before the US Open, she did all 72 sprints for the first time. After the tournament, she said, 'Those doggone sprints, they saved me. I can go forever.'" Serena advances to the US Open quarterfinals, where she beats sister Venus. Then, in one of the most shocking upsets in tennis history, Serena loses to unseeded Roberta Vinci in the semifinals. Mouratoglou: "On this morning, I saw that she was in a bad day. She had a lot of pain in her knees and the stress went higher. There was clearly big pressure from the outside. The US Open advertising was about her only. Vinci played the match of her life, and Serena made more mistakes than usual and would not go 100 percent on her shots. She couldn't hit as many winners as usual. The good thing, and it's what I've told her, whether you do this or not, it is not going to change who you are in your career. You've won 21 Grand Slams. You are going to win others. You are going to beat the record of all time." Roberta Vinci (professional tennis player currently ranked No. 8): "Before the match, I spoke with my coach. He said, 'Don't think that this is your first semifinal in singles. Enjoy the moment.' There are no tactics against Serena. At the beginning, I was nervous. But I think Serena was more nervous than me. She had a lot of pressure. Until the end, I said in my mind, it's impossible that I can win, but try to stay focused every single point. Don't think about Serena." Roberta Vinci celebrates a point against Serena Williams during a 2015 US Open semifinal. Vinci would later win the match. Garrison: "In the tennis community, that loss to Vinci doesn't take anything away from Serena. I was at the match. I knew the pressure would hit her, I just didn't know how and when. When Steffi did it, she didn't have social media. Serena couldn't get away from it if she wanted to." Mouratoglou: "For quite a while, she was really down because she felt like she failed. 'I let them down.' She didn't want to see people. Even though she's had more success than anyone, when she fails, it is more painful than for anyone else. Other players lose every week, or out of 30 weeks, they lose 27 or 28 times. She does not. She had to go through this process. She knew she had time, so she wanted to stay away from tennis, so she did." At New York Fashion Week, Serena presents her fall 2015 collection with Home Shopping Network in front of Vogue editor-in-chief Anna Wintour, models Gigi Hadid and Lily Aldridge, and Drake. She announces in October that she'll withdraw from the final tournaments of the season, the WTA Finals and the China Open. Serena Williams takes a bow after her fashion line's show during New York Fashion Week in 2015. Grossman: "She had just come off a disappointment at the US Open, and she put herself into this show. She cast all the models. She styled and accessorized every outfit, worked with the hair and makeup artists. She chose every piece of music. During the show, she was behind the scenes making sure the models were going out at the right cadence; everybody is put together in the right way. At the end, she came out and took a bow and looked fabulous in one of her creations." Sports Illustrated names Serena its Sportsperson of the Year, the first solo female to be awarded the honor since middle-distance runner Mary Decker in 1983. Serena is criticized for the magazine's cover image, in which she is wearing a black lacy bodysuit and stilettos and is seated on a golden throne. Garrison: "Richard and Oracene did a very good job of making all of their girls comfortable within their own skin. Venus and Serena told me that their mom told them every day that they were beautiful, strong women. To hear that every day, and then believe it, is amazing. I've struggled with my weight for years. She tells me, 'Keep going, don't stop.' She's just as encouraging to people around her as she is to the world. I don't think she tries to be a role model to girls, I think she's just true to herself, and that's enough. She doesn't have to prove anything to the doubters anymore." Oracene: "Other athletes would read things in the press and then couldn't do their jobs. So I made them stay away from press. Nothing negative inside their heads. Once you put fear in your head and get scared and doubt yourself, you can collapse. To be successful, you have to have confidence in who you are and what you stand for and the hell with whatever they say. The girls used to say, 'Mom, why do you say you don't care?' Because I don't care what people think. I know who I am." At the Australian Open, Serena looks dominant in the first six matches but loses in three sets to No. 6 Angelique Kerber in the final. She follows with a loss to No. 4 Muguruza in the final of the French Open, marking the first back-to-back Grand Slam final losses in her career. Angelique Kerber (professional tennis player currently ranked No. 2): "It's an honor being on the court with her, and winning against her in Australia was special. She came to me after and was so happy for me that I won my first Grand Slam. This is what is special about her; she was so nice after a really tough match that she lost." Mouratoglou: "All that period, she played good tennis. But one of the things that makes Serena Serena is her mental toughness, her ability to play unbelievable when it's necessary, and this disappeared. She lost it. During that period, she was playing very good tennis. But this killer instinct, she didn't have it. She was not Serena." Serena finds Serena, winning Wimbledon for the seventh time and taking her 22nd Grand Slam title, tying Graf's Open-era record. 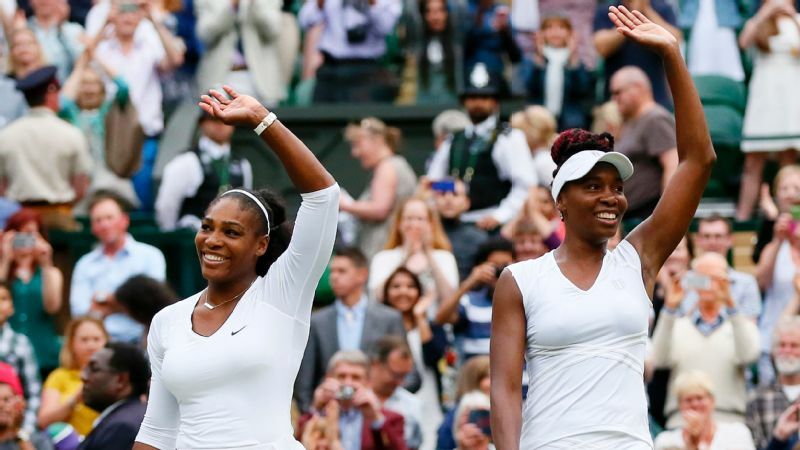 Serena and Venus Williams celebrate their women's doubles victory at Wimbledon in 2016. Serena also won singles. Mouratoglou: "Two days after the French, she called me. I hung up and turned to my business partner and said, 'Serena's back.' She talked to me in a way that was Serena. The champion's mentality, all the things that make her so special, came back. I don't know why it came back at that time. Maybe the loss at the French was one too many. You never know why it clicks. But it clicked." A shoulder injury forces Serena to pull out of the Rogers Cup. But nothing, she says, will keep her from playing in the Rio Olympics. Clearly struggling with pain, she loses in the third round of singles and first round of doubles play and returns home to Palm Beach, Florida, to rehab and prepare for the US Open. Fernandez: "She was a great leader at the Olympics. She walked in the opening ceremony and went to the village a couple of times. She and Venus are big on pin trading, and Serena showed the rookies how to get the most pins. Even though she wasn't 100 percent, she tried her best to get fit and healthy. She didn't want to miss it. I will remember how excited she was to be back at the Olympics." Mouratoglou: "She was injured. She couldn't serve. She had pain playing. If it was any other tournament, she wouldn't have played. Afterward she took a day off, and we got back to work." Serena Williams competes at the 2016 Rio Olympics, where she loses in the third round of singles. Home in Florida, Serena Snapchats a video of herself performing her version of the routine that won U.S. gymnast Simone Biles all-around gold the day before in Rio. Mouratoglou: "She had watched gymnastics on TV. She started to do it and then laughed at herself and said, 'Film me.' If I can say something of her character, she is more open to people now. The documentary was the first step. Snapchat is continuing the same. She hasn't changed, but people are getting to know her." Serena arrives in New York to begin training for the US Open. Shilstone: "I only have a week to get her ready, so we do crazy things. I hooked her up to cables that launch her like an F-18 to work on acceleration and deceleration while changing direction. We do standing bike sprints. There's a drill I call the fun 'n' gun that's based on my work with Army Rangers. If you look at the motion of the server, it's the same as the release of a shot put, so I have her shot-put a medicine ball." 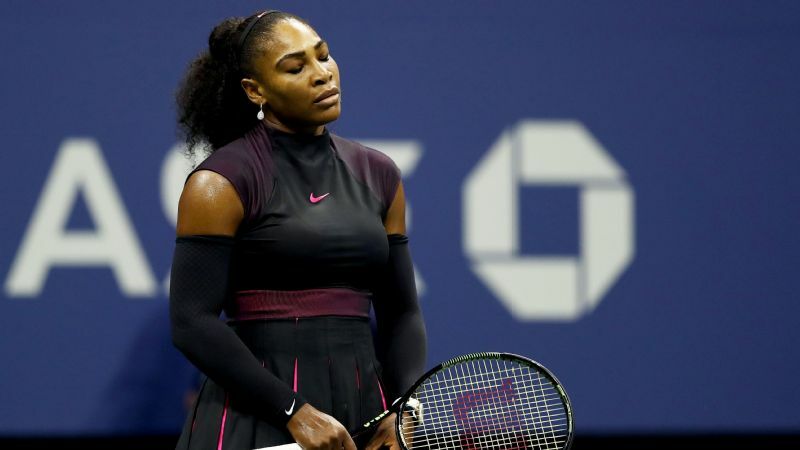 Still recovering from her shoulder injury and dealing with a left knee injury suffered in the second round, Serena commits 31 unforced errors and six double faults in a stunning loss to No. 11 Karolina Pliskova in the US Open semifinals. When the world rankings are released four days later, she loses her No. 1 ranking to eventual US Open winner Angelique Kerber, ending her record-tying -- with Steffi Graf -- 186-week streak at No. 1. Two weeks later, she turns 35. Isha: "My first conversation with Serena after that match was, 'What are you watching on TV?' I went to her room at the hotel, and we all chilled together and it wasn't about tennis. It was about being sisters and hanging out, and that's what we did, all of us. She still took her time, and you knew that's what she was thinking about. But it's not what we talked about. "When did she start thinking about next season and the Australian Open? The moment she stepped off the court, she was already there." Serena Williams during her semifinal against Karolina Pliskova at the 2016 US Open. Accompanied by her sisters, mother, niece and nephews, Serena returns to Compton for the first time in years to open the Yetunde Price Resource Center in honor of her late sister. The next day, she and her family return to the East Compton tennis courts where she and Venus learned the game to dedicate newly refurbished courts to the community. Aja Brown (Mayor of Compton): "The impact her presence has on this city is phenomenal. Her coming back is truly a beacon of light. 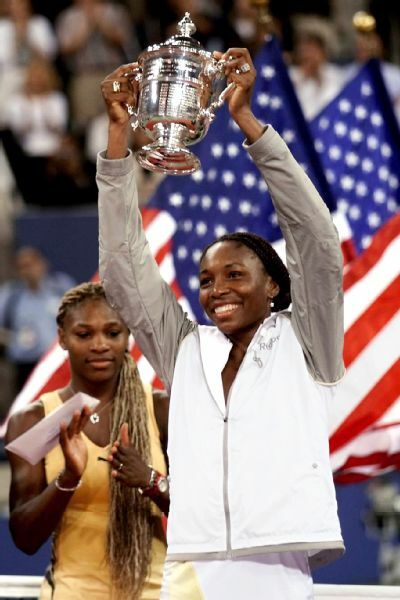 She and Venus were awesome ambassadors and helped to lift the city in a time when it was really tough to be here. The city was plagued with violence and had so many negative connotations with the name Compton. But when we were able to turn on the TV and see Serena winning, dominating the game of tennis, we all felt uplifted. I was a little girl watching her do things I never thought were possible, so to be able to introduce her today was a great honor." 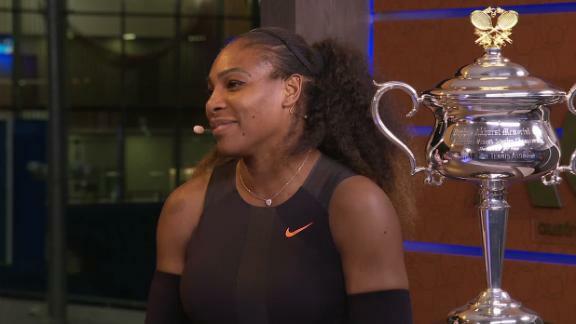 Isha: "Serena's doing this 30-day challenge, where she wants to do cardio every day for 30 days. This is a person who doesn't enjoy working out. When we got back to the hotel, it was late. Serena was like, 'I've got to work out. I'm committed to these 30 days.' She went to the gym and did her cardio and then was so energized. Her dedication is inspiring. She's helped all of us." In a 14-line poem posted to her page on Reddit, Serena announces her engagement to the website's co-founder Alexis Ohanian, whom she's been dating for a year-and-a-half. On his Facebook page, Ohanian posts the words "She said yes," as well as links to Serena's Reddit post. Shilstone: "Serena called me and said, 'Guess what, Mackie? I'm engaged!' She knows I don't follow Twitter and all that. And I said, 'Wow, you're getting married! But what are we first? We're warriors.' I was saying to her, 'Keep your head in the game.' I've been around for eight years, so I've seen a lot of people come and go, and this young man is the real deal. He is a genuine, nice man and she is very happy. I told her, 'Serena, now you'll have to set me up on Reddit like you did on Twitter.'" 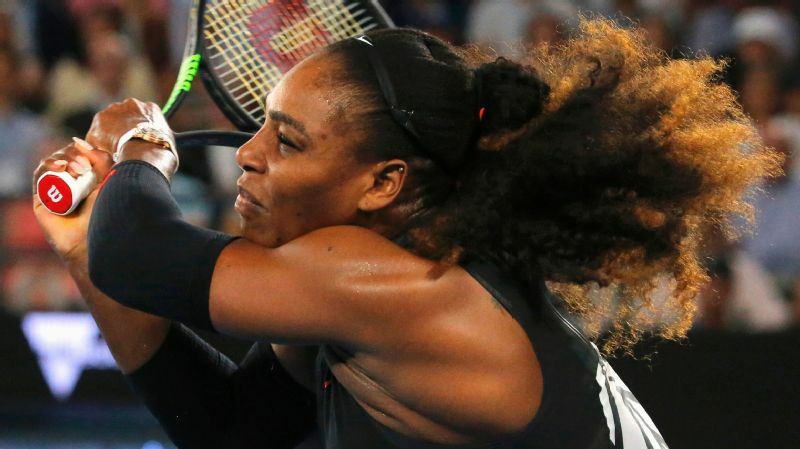 In swirling windy weather, Serena loses 6-4, 6-7 (3), 6-4 to American Madison Brengle in the second round of the ASB Classic in New Zealand, her first tournament since the US Open. After the match, she calls the conditions "my least-favorite I've ever played in" and turns her focus to the Australian Open. Shilstone: "We've been conferring a lot since the US Open. She took a tremendous amount of time off to contend with injuries. Right now, she has some ring rust, and it's going to take a little time to shake it off. Tennis is all about timing, and right now, she's working on her timing. She needs to get it back, and you do that by playing games. She's a seasoned veteran, so it won't take her long. "On the first day I met her in New Orleans eight years ago, I asked her, 'Are you at your best?' She said, 'I don't think I've ever been at my best.' If I asked her that question today, I am willing to say she'd tell me the same thing -- because the minute she says, 'Yeah, I'm the best I can be,' it's over." Isha: "I want to see her win 23 for her. She is her own worst critic, her toughest competition, and she's really hard on herself when she doesn't succeed. I'd like to see her win it as soon as possible, but for her. Not for me, not for anybody else. I want that so badly for her." Mouratoglou: "It was good thing she lost early. It helped her to regroup and get ready for the Australian Open. Of course, winning would be good, too, but losing was a wake-up call. Not that she was not doing the right things. She prepared well, but she realized that if she is not 100 percent focused in a match, she can lose. Going into Australia, she knew she had to be 100 percent focused in the first two rounds." At 5:03 a.m. 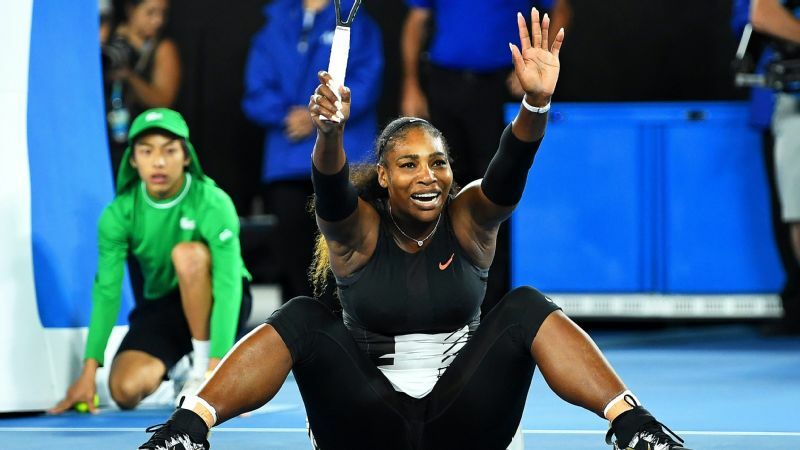 ET, Serena defeats big sister Venus 6-4, 6-4 in Melbourne to win her seventh Australian Open title and capture her 23rd Grand Slam, giving her more Grand Slam titles than any player in the Open era. There is no arguing it any longer: Serena is the greatest. After the match, Venus addresses the crowd first. She motions toward Serena and says, "That's my little sister, guys. Congratulations, Serena, on No. 23. I have been right there with you. Your win has always been my win. I think you know that I'm enormously proud of you." Serena responds in her speech by saying, "I really would like to take this moment to congratulate Venus. She's an amazing person. There's no way I would be at 23 without her. There's no way I'd be at one without her. There's no way I'd have anything without her. She's my inspiration -- she's the only reason I'm standing here today and the only reason the Williams sisters exist." 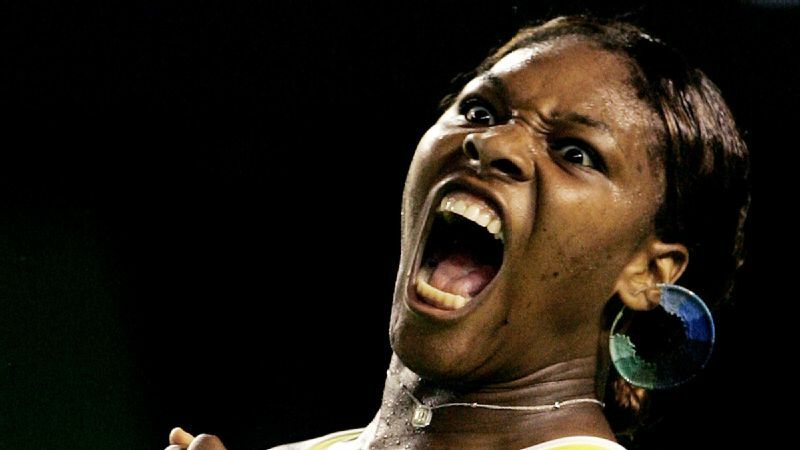 Serena Williams reacts after winning her 23rd Grand Slam title at the Australian Open. Garrison: "I watched. Of course I watched. The match was very emotional. Their speeches were heartfelt and humbling, and I heard them speak like I hadn't in a long time. I've known Serena and Venus since they were 7 and 8, and to watch them grow as women on and off the court, overcome all they have, to play in their 30s the way they are playing, it's amazing. They are making their own rules. "Being Serena's mentor when she came on tour, she has defied all odds against what people thought she could do. I will never forget Billie Jean King saying to me one day when Serena was young, 'She can be the greatest of all time if she hones it all in.' To watch her wisdom and physical and mental abilities come together to win 23 is exciting. She understands her place in history." Mouratoglou: "It was very emotional. It's the first time since the start of my career with Serena that I had more stress than usual, the whole day. I felt the weight of the history. I tried to hide it as much as I could to her, but there was much more pressure. "I don't think playing Venus was a big deal for her. I think the importance of winning the 23rd Slam was much more important than who she plays. She obviously prefers to play someone else but was focused on finding a way to win. She doesn't like to play Venus, but she was happy that Venus was in a final again and back to a great level. There was positive and negative. "What's next is to establish her own record. Will it be 23, 25, 30? Nobody knows. But I think it's the most exciting journey for someone like Serena, to make her record. "Of course she is still enjoying the game. Otherwise she would have stopped. She loves to play, but she also loves the idea of winning Grand Slams and exploring foreign territory. The fact that we don't know where we're going next, and how far we're going to go, makes it more exciting than beating any record. She is leaving a trace in history and I want this trace to be as big as possible." Additional reporting by Lindsay Berra.